Meantime, I would like to ask those who are living in the Philippines to join the discussion. We can talk about the ideal condo TO RENT. Later on, we can discuss the ideal condo TO BUY..
so that they can have an easier and shorter commute for each day of work. They may return to their provincial home on the weekend. Those whose only, or whose principle property will be the one that they are seeking to rent, and live in. On this thread, we will also talk about what BUYERS are looking for in Makati condos. 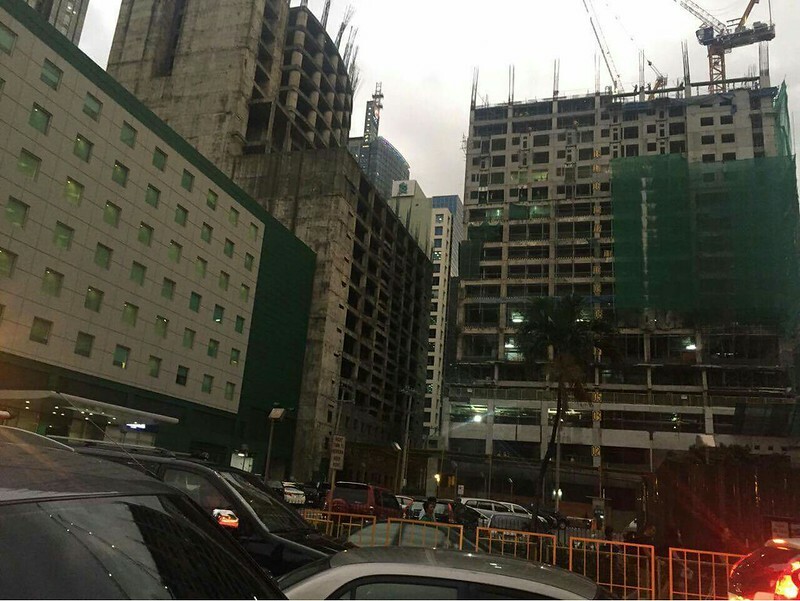 It seems that OFW's (and others) who have bought condos in Makati, use these threads, and the photos they include as a way to monitor the progress on properties they have purchased, or are considering for purchase. One of the key factors to consider when Renting or Buying is AFFORDABILITY. The more rapid increase in property prices (beyond CPI price inflation) has been aided by falling interest rates. And also, what sort of Tenant or Buyer the Condo for are looking at is targeting. The median for Makati (alone) should be much higher than that PHP 22,000 for the Philippines as a whole. - then two workers sharing, may be able to afford a Php 20,000 studio (1/3 of their combined salary). And the better-paid workers may be able to afford a better or larger flat. 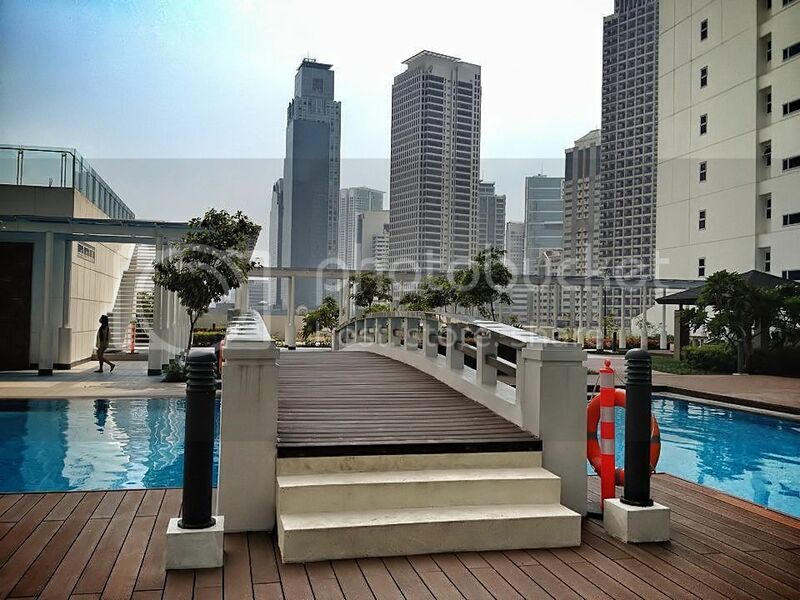 you are not going to see many decent condos - including studios renting below Php 20,000 per month. "Residential sales for new and pre-selling developments started to pick up in 2Q09. But secondary market residential sales are still sluggish. There is a strong preference for newer developments and this has kept the number of transactions in the secondary residential market slow. Nevertheless, implied prices of luxury residential condominiums in Makati CBD were still flat at P101,000/sqm. Prices of pre-selling condominiums have are testing the 120,000- 130,000/sqm level, the most expensive being the ultra-luxury residential developments. The reason why condominium prices are holding up is because Makati remains an attractive market for investors who are buying units to be rented out. With no new developments to be completed this year, capital values are expected to decrease by a mere 1% over the next twelve (12) months"
Eventually, we may want talk about what BUYERS look for in Makati condos. It seems that OFW (and others) who have bought condos in Makati, uses these threads, and the photos they include as a way to monitor the progress on properties they have purchased, or are considering for purchase. LERATO - a pretty bold asking price? "Selling a 31sqm studio unit with parking at tower 1 of Lerato. Fully furnished with top notch appliances. All for 5.5M neg. Message me if interested. It's fully paid also with clean title." This is a pretty bold asking price... though it does include parking. Is Lerato really fetching such a price now? 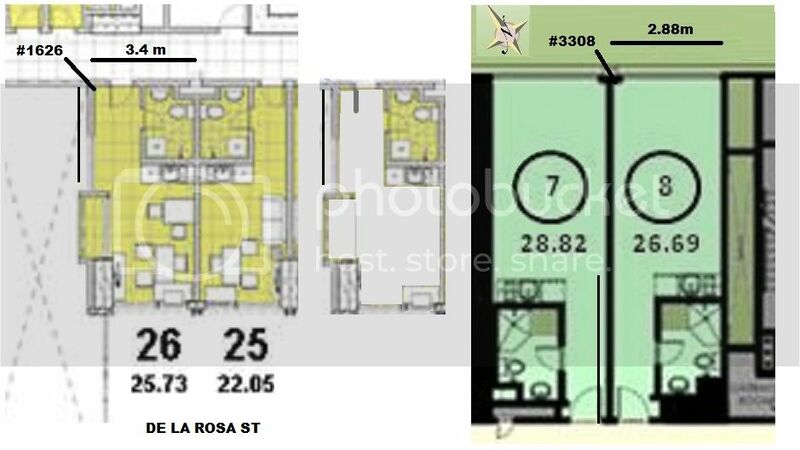 "RFO studio for sale, P3.5M fixed." These huge differences are typical of a non-transparent and illiquid market, where bids, offers, and recent transactions are not well known. I expect the huge gap is the difference between someone trying to cash a decent profit at P-148k psf and a keen seller (distressed seller?) at P-113k psm. If people were better informed, and it was easy to view, buy, and finance flats in the Philippines, then that gap would narrow. Perhaps over the life of this thread, and this website, we will see a substantial narrowing of the valuation gap. JAZZ .... Does it live up to its online popularity? Jazz Residences has the most popular thread on SSC - But what is it like as a place to live? I visited 2-3 flats there late in 2015. I was impressed with the lobby, and also the amenities. In fact, i had a very positive opinion... Until I saw the actual flats. I was not keen on the layouts of the 1BR flats. Having said this, the suggested Rental prices looked reasonable for 1 BR flats, in the location. I am renting out my unit to a Singapore expat. my other friend is renting his one to a Malaysian expat. for renters working in RCBC, GT International and other offices in this part of Ayala, they prefer Oriental Gardens Makati than say Jazz. In any event, 18 months after the turn-over of my Tower A unit, I can see defects such as creaking tiles and grout powder coming out of my floor both in my living room and my bedroom. The funny thing is, nobody has lived in my unit. I only get to visit it for an hour every month when I pay my dues. So I can't attribute the problem to wear and tear. I have a good mind to change the whole flooring but the property manager is charging P30k as major renovation bond plus P3k admin fee. (A minor renovation like the installation of a split-type ACU is P10k bond plus P1k admin fee.) They will only return the bond after the work but keep the admin fee for themselves. Not moved in yet to my unit in C Tower. Can anyone tell me how do you reach your tower from the street level? Only one point of entry around Jazz? I'm presuming that you enter from street level and take a certain lifts up to the accommodation towers? How secure is this.. is the lift coded in anyway to your key? Many thanks..
"...a virtual tour of the model units for towers Kirov and Sakura. Allow one to experience and visualize the layout and finishes of one of the units from the said towers." Well done to I.M. in starting this group, Manila R.E.I. communicating collegially about Real Estate opportunities on their doorstep. How does that compare with actual Mortgage interest rates - & where are interest rates headed? If interest rates should go down, don't you think yields (Rents) will fall too, especially since there are so many new condos under construction? On the other hand, there are may people who might want to move into a flat in Makati, if Rents came lower. Kroma can be positive and negative, since it's in the center of everything. neg - I think it will be a bit crowded and noisy? good for single expats living but not family type. Positive - definitely a good investment since the price will increase after all office buildings and entertainment center finish. Lerato is a bit outside the center but not too far so I think it's great, perfect for family like me. 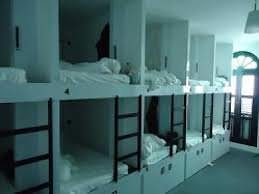 But we are still thinking whether to take it or not, as only 2 beds available right now on tower 2. And I really like legazpi area side. As of now, I will not consider Circuit, I can't remember the price per sqm. Setting aside the price, that place will take a while to get developed. Considering there are still a lot of units available in Makati, I won't invest in there. I am not yet convinced that it will be a great investment. We went to view a couple of old condos in legazpi and Salcedo area like one legazpi park, senta, antel platinum etc... we are debating whether we should take old condo or new ones. Old condo is cheaper but need to do a lot of renovation while new condo looks great but price is higher. I too am intrigued by the idea of buying an older condo - if they are cheap enough. When we first went to Makati to look at property, that was over two years ago, we thought it might be possible to see some older properties - in the same way that it is possible and easy to view older properties in Hong Kong. We thought we might find an estate agent, walk-in, and within a few minutes view some older properties within walking distance of that agent. I'm not sure why, but it doesn't seem to be possible to do that in Makati, or anywhere in Greater Manila. You might get a viewing of a flat or two if you have an appointment, but that might take days to arrange. Instead, I searched on the web, to get an idea of prices, and walked around to see what areas I would consider living in. 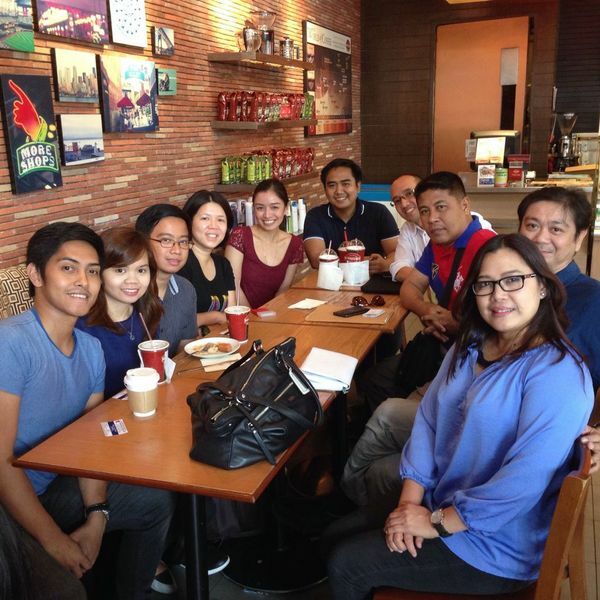 I also spoke to friends from HK who had moved to Philippines. I realized that if I moved to Manila, and made some contacts, then if I was patient enough ... Over some weeks or months I might hear of a bargain, view the flat, and buy something that was a genuine bargain. But I might have to look at a dozen or more older buildings before I saw something I wanted to buy. The alternative of buying a new property still under-construction seemed better for me. That way, I could get a new property without hidden flaws, have some choice of which apartment I bought, and also have no worries over the issue of getting clean title to my property. 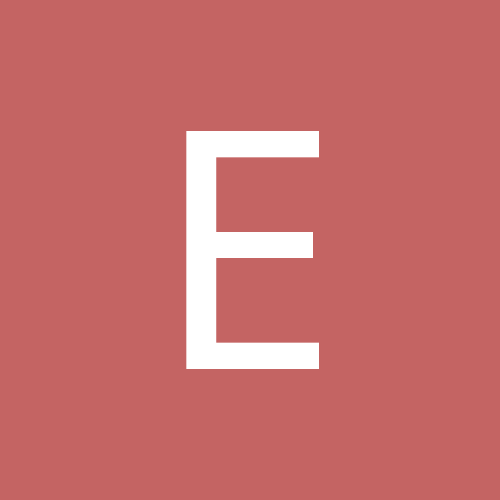 After some research, I learned that (ALI) Ayalaland's branded affiliates - that's Alaya Premier, Alveo, and Avida - were the best known of those developers that had a top class reputation. And, funnily enough, their prices were not much higher than the competition. The main things that ALI did was different from their competition was that they required larger payments and sooner, than some other developers. Also, they did not allow flipping by their customers prior to completion. This may cut into sales a bit, but it also means that ALI's properties go into the hands of long term holders who are financially capable. There are very unlikely to be panicky sellers of any ALI properties under construction. If there are people with financial issues, the properties revert to ALI, rather than showing up in the secondary market at distressed prices. This stability should be good for the owners of properties in Ayala projects. I am now happy I bought two years ago. Prices then were maybe 10-15% lower than they are today, and I got the property that I wanted - Mine is on the 4X th floor with an open view. It may not be easy to get the same flat after completion in the secondary market, even if I pay was willing to pay the full market price. The better flats on higher floors might rarely come onto the market. I haven't decided yet whether I want to live in it, or rent it out. But like you, I think the completion of high class office buildings as Citygate (including Alveo Financial Tower, AFT) should enhance the demand for my property, if I decide to rent it out. Apart for lack of choice, and quality of management, another thing to think about in the older buildings, is the amenities. I got spoiled in my prior property in HK - the one I sold in Sept, of last year. We had nice amenities, like a swimming pool (including a small one indoors), a cafe, a library, a computer room, as was as a gym, sauna, and steam room. Few properties in Makati have anything close to that, especially in the older condos. Kroma (with 821 units) has most of these facilities, and Lerato (with over 1,200 units) has even more - Probably the Best Amenities of any condo in Makati ! I hope this is useful, and provides some food for thought. when taking a first look at buying in the Philippines. Many Filipinos are planning to move house or apartment in the near future, and almost 80 percent of them said their main reason for doing so is to buy their first home, according to a recent survey. Global property website Lamudi Philippines recently released a report saying that other reasons for moving house, or apartment cited by the survey’s participants include area preference (either looking for a better area, planning to move to another city, or planning to live close to relatives) (14.66 percent), work-related relocation (2.4 percent), and proximity to schools (1.44 percent). More than half (55.05 percent) of the respondents cited Metro Manila as their preferred area for their property purchase, with Quezon City being the most preferred city (19.47 percent), followed by Makati (8.65 percent) and Manila (8.41 percent). Cebu Province is the next most cited large area after Metro Manila. Almost 7 percent of the respondents said that they are planning to buy a property in Cebu. The province is followed by Cavite at 6.73 percent. The survey also found that Filipino homebuyers are fast becoming internet savvy. Almost 80 percent of the surveyed participants cited the Internet as their starting point when researching about real estate. These survey participants cited real estate websites (such as online listings platforms), social media sites, and search engines as their usual starting point when researching about properties in the Internet. I realized this building is ugly compared to its renderings and glassy neighbour, but since its there anyway, would this be a good investment if given the opportunity? The location is kinda irresistible and SOHOs are kinda hard to get in good locations. Of course, the unit itself has to be very very good (i.e. high floor, good orientation with views as oppose to ones facing the tall building next door, etc) for me to take a bite on. Despite, the "ugly" design people like it enough to think about buying. Will the prime location (on the DLR walkway) overcome the design concerns? 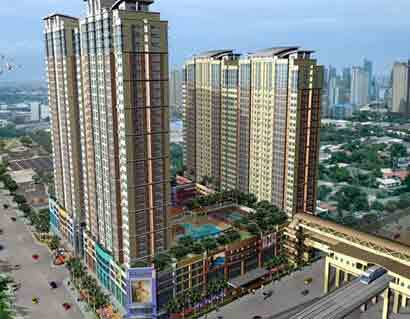 Eton Tower Makati a 40-storey prime property developed by Eton Properties of Lucio Tan Group of Companies. it is just a few meters from Ayala Avenue and strategically located at the heart of Makati., bounded at the corner of De La Rosa and V.A. Rufino Street., (formerly Herrera St.) in Legaspi Village., Makati City. P 3,100k / 22.00 = 140.9k : 16 mar. ( 5 days ago) : "turnover Dec. 2016"
P 2,950k / 22.05 = 133.8k : 15 mar. ( 6 days ago) : 37th Fl/ t/over Aug.16? P 7.000k / 49.52 = 141.4k : 09 mar. P 7,700k / 50.00 = 154.0k : 09 mar. P 3,100k / 22.00 = 140.9k : 04 mar. ( 2 weeks ago) : + other units? Cheapest studio in Makati for sale. Rush. Reselling my 23.15 sqm studio type unit in residential area at 26th floor for 2,750,000 php. Target Turnover is 2nd quarter of 2016. The design is actually quite awful. The living room/kitchen areas have no ventilation, apart from a small range hood above the stove that is only effective 4 hours per day because the main building exhaust fan has limited functionality so they switch it off most of the time. The management of Empire East do not allow unit owners to install aircon in the living areas, so the place is really uncomfortable and sweaty due to the heat and humidity. And when you try to cook anything, it brings tears to your eyes. The bedrooms are OK, because they have windows and aircon, but if you want to have comfort but don't want to spend all your time in the bedroom, you are out of luck. I bought my unit when only the model unit was built, and it had a split aircon in the living area. I made the mistake of thinking that this meant I would be able to have the same in my unit. Very bad assumption. 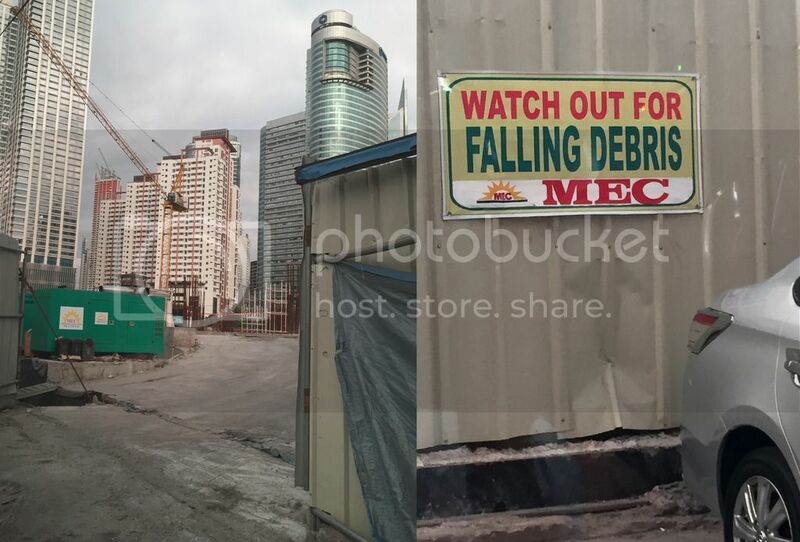 Right now, debris would need to fall Upwards to be of danger. And I was surprised to see that both the Rise and the Air seem to be at the same stage of construction. This surprised me since I think the Rise was started 6- 9 months earlier. It occurred to me to ask a woman running a food kiosk about this. Her view faces both properties, and she sees them all day long. So I asked, "Can I ask you a question? Did these properties start at the same time?" I think she thought I was asking if they were the same property. So she pointed straight ahead, and said, "SM;" and then motioned to the left, and said, "Shangrila." So she clearly knew something about her surroundings. So I asked again, "Yes. Did they start at the Same Time." She pointed again at The Rise: "Stopped." I replied: "Okay. When stopped?" That got me a two word answer: "Two months." Can you get more definitive than this? The sign on the site, says: General Contractor, MEC", over a large yellow sun. I made a note to investigate this company name. Global gateway cities (London, Paris, New York, San Francisco, Tokyo and Sydney) remain the primary target for global cross-border investors over the next 12 months. These markets have the advantage of offering large lot sizes and volume of stock that appeal to global mandates. ...For some investors ‘overcrowded’ core markets are being seen for longer-term investments rather than short term trading. 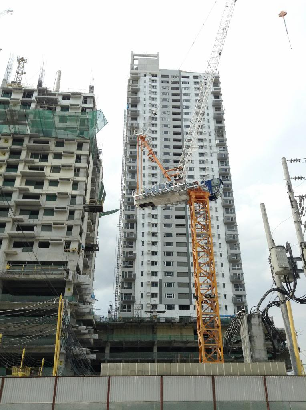 Following a pre-selling condo boom that began late in the previous decade, around 13,400 new condominium units are anticipated to be completed in the major Metro Manila CBDs in 2016, more than double the levels in 2015. On average, around 7,500 units shall be completed until 2019. This will lead to an increase in the CBD condo stock by 45% in such a short period of time. Developers have begun looking for creative strategies in order to deal with their rising ready-for-occupancy (RFO) inventories, either through more flexible payment terms or to develop leasing models in order to create some cash flow from these unsold units. As part of the developers’ diversification strategies in the face of a softening residential sale market, we anticipate that multi-family/apartment leasing business models similar to other countries will soon emerge. On the other hand, the retail market is expected to reach a historical high in 2016 with 725,000 sqm of new retail space coming up. This will of course increase demand for warehousing and storage space, amid the already tight market in Metro Manila. Warehouse rentals have already exceeded P300 per sqm in key areas in the metropolis. Given the increase in demand and the worsening traffic conditions in the metro, we see rates rising in the short term in key areas. The Philippines has a thriving business process outsourcing (BPO) sector. The BPO industry is now one of the country’s biggest sources of revenues, providing employment to a large number of workers. The country’s revenues from the BPO industry is expected to reach US$25.5 billion in 2016, according to FT Confidential Research. By that year, it is estimated that as many as 1.3 million people will be employed in the BPO sector. Maybe this will change. The Philippines will also soon experience a demographic ‘sweet spot’. The country has the third youngest population in the ASEAN region, next only to Lao PDR (median age of 21 years) and Cambodia (median age of 22 years). Based on its demographic profile, we can expect a strong demand for starter homes. The Philippines has a huge housing need at the low end. There are as much as 300,000 households in Metro Manila residing in informal and uninhabitable housing units which composes 8.7% of the total Metro Manila population. These people live in appalling conditions. Many others live in very poor conditions. Socialized housing units, or those which cost less than PHP 450,000 (US$ 10,800) can be purchased with a monthly amortization of PHP 2,302 (US$ 56). The Pag-Ibig Fund, (which is the Filipino word for love), the country’s state-owned and subsidized housing loan provider, provides a fixed rate of 4.5% for 30 years for socialized housing units. Jazzing it up... To justify the price? 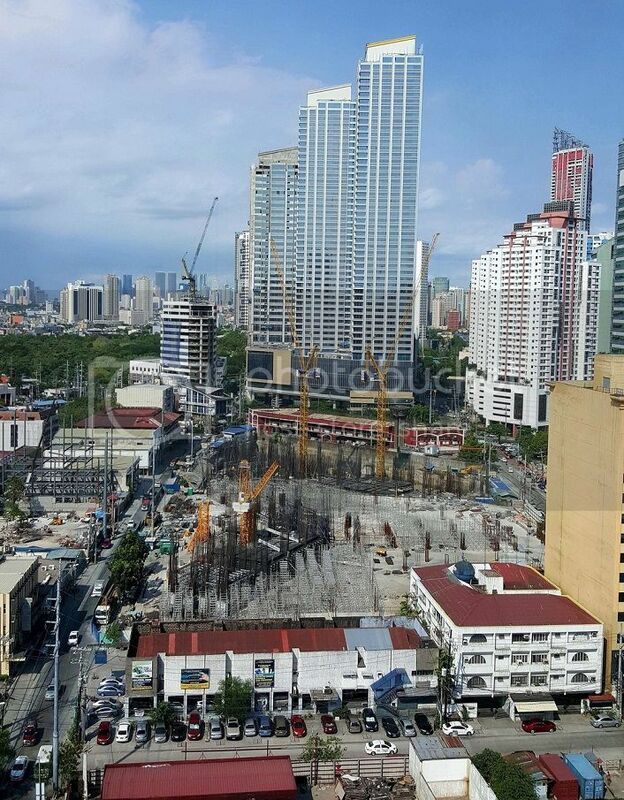 ALVEO's new The Gentry Residences, will share its space with office condominiums, and a mall. It also offers exclusivity like no other with only 11 units per floor for a total of only 237 units. the Pause​ &Play Room, Co- Lab ​(Shared Workspace​) and Town Hall (Function Room). LOCATION: Front St: ​L.P. Leviste St. / Back St: ​San Agustin​ St. Presumably, the shared workspace is to make them attractive to people who will work from home, and not want to pay the rising office rents. Will we see new types of Working arrangements arise, to work within this space? 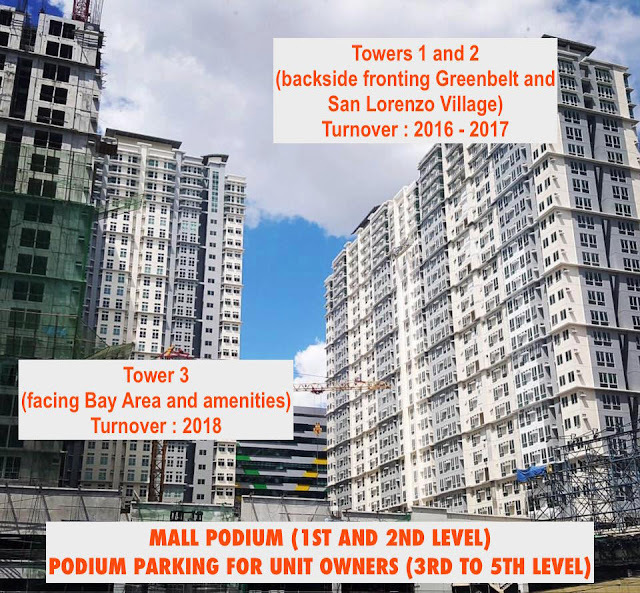 "Introductory Average Price: Php 175k/SQM for the first 25 units sold"
Megaworld likes to connect Time Pressure with its pricing - yet this building completes after 2020, I believe. and stand by their argument that if you don't buy now, prices will push higher. "I have decided that I must upgrade my internet capability. "So I am bottom fishing for the lowest possible rental in one of these areas. will so I wonder if you might have a suggestion for me." I would like to inform you that your unit at The Rise Makati by Shangri-la Properties has another price increased of 8%. Congrats on your investment. Minimum value for The Rise Makati now is 4.3M. Your unit's value should benefit. Of course, the profit only becomes real when you sell. wow parking seems really expensive. Ranging from 1.2M++ to amost 1.5M. Lerato is still sub 1M. Any thoughts on this? One video from a British national about the property rental business. So I am starting to see more foreigners. yet "hedging" is a strategy that is employed by a lot of foreign investors IMO. -- for some posters -- is just the "hedge". IS MAKATI Too Expensive now? Kevin gives some good advice, but it is not right for everyone. For instance, he recommends "not buying in Metro Manila". He thinks it is too expensive. "If you are buying there to be close to your girl friend, she may not mind traveling an hour or so outside Manila, where prices are cheaper"
It is easy to have commutes of one hour or more INSIDE Manila, and some of those commutes can be pretty horrific. Personally, I want easy access to the airport, and a more cosmopolitan life. I also want a property which is easy to rent and is salable. These factors point me to Manila, and more specifically to Makati, BGC, Rockwell, or Ortigas. The main problem is the present oversupply, which may make it harder to rent, and harder to sell. Cost of living : "you can sit in the middle quite comfortably"
"We were living on 5,000 pesos per month... back in 2007"
That's incredibly tight - unless you have nothing to pay for rent, or are sleeping on a beach in the provinces. As it is, the association fee on my small studio flat is about P 2,000 /month, and that will increase if/when I move into a larger flat next year. station and around 6 apartments/flat in that same building in the Cebu area I believe. He says he's doing fairly well with income in PH, Spain and UK. He's a video about buying foreclosures properties in PH.